// we assume we did until proven otherwise. 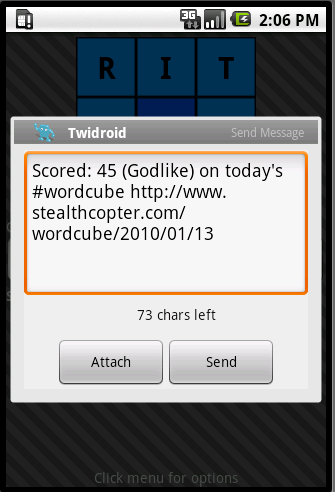 Below is a screenshot from the wordcube (available on market) application using this function to make the application interact with twitter. In a future post I will be demonstrating how to interact with the android market, this can be use in conjunction with something similar to above to try and run a program and if the program is not installed the user can be taken to the market to download a program. Note that there is no such MIME type as “application/twitter”. You might also consider using PackageManager to detect whether an Intent will be used rather than causing exceptions to be raised and caught. I believe that applications can be set to listen to whatever MIME type they choose, and I know for twidroid that “application/twitter” works. However it may be that other twitter applications do not, and so it might be more of a well-rounded solution to send “text/plain” so that any program that accepts text can respond and the user can choose from a list. What do you think? Also I will have a look into PackageManager to save using try/catch, thanks. This (see link below) provides the basis for a more elegant solution, which can be used to create a chooser displaying only items that match providing they are installed, or provide an option for user to goto market and install them. I will try and update wordcube to use this method, and will post a new function once it is created.